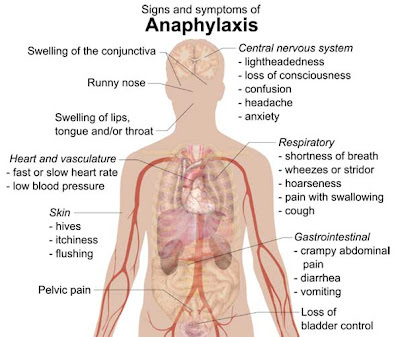 Anaphylaxis is a serious allergic reaction that is rapid in onset and can cause death. 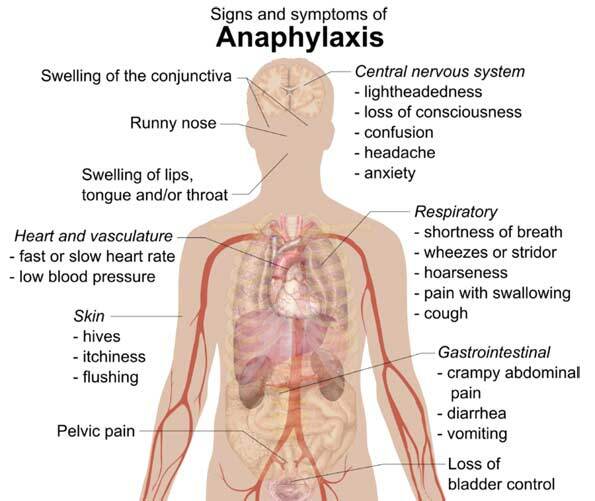 Anaphylaxis typically causes a number of symptoms including an itchy rash, throat swelling, and low blood pressure. Throat swelling is a very serious symptom because the airway can be obstructed. Other respiratory symptoms and signs that may be present, including shortness of breath, wheezes or stridor (a high-pitched wheezing sound resulting from turbulent air flow in the narrowed or obstructed upper airway). Wheezing is typically caused by spasms of the bronchial muscles, while stridor is related to upper airway obstruction secondary to swelling. Hoarseness, pain with swallowing, or a cough may also occur. With symptoms of Anaphylaxis present, emergency medical treatment is necessary immediately. The treatment of Anaphylaxis with airway obstruction is one of the most urgent medical situations seen in the field of Emergency Medicine. Call 9-1-1 immediately is Anaphylaxis is suspected. Victims with known serious bee or wasp venom allergies often carry Epinephrine pens or Epi-Pens.